Easy Christmas crafts for kids are best when they offer quick and easy materials and instructions. Fun Christmas crafts make happy kids, and less clean-up makes happy moms. We know you're busy this holiday season, so make time for your kids without stressing out about planning a hectic craft time. Check out our newest free eBook featuring 24 kid-friendly Christmas crafts that are easy to make and require a simple set of materials. Included in this eBook is our collection of our best kids Christmas crafts, including Santa's Favorite Ornaments, Cards and Gifts from the Kids, and Easy to Make Decorations. There's something for every age and every style. Get into the Christmas spirit with your kids! Download Santa's Guide to Easy Christmas Crafts for Kids eBook for FREE now! A Christmas tree wouldn't be the same without ornaments, it would just be a large evergreen that looks out of place in your home. There's no better way to deck out your family's Christmas tree with all the spirit in the land than to make your own ornaments. Homemade Christmas ornaments are fabulous for two reasons. First, with all the many elements that comprise the holiday of Christmas, the cost easily adds up. Homemade ornaments are a great money-saver because you can use any materials you like, and as crafter you probably have tons to choose from. Second, store-bought ornaments don't have the same feel as those you make with your own two hands. Your kids will never feel nostalgic about generic ornaments that you put up each year and then take down and pack away. Make it a Christmas tradition in your family to craft your own ornaments and add some extra special meaning to decorating your Christmas tree. This section is packed with plenty of ideas to you give and your family inspiration for homemade Christmas ornaments. Pick a project that everyone will love and get started creating ornaments you'll all cherish. 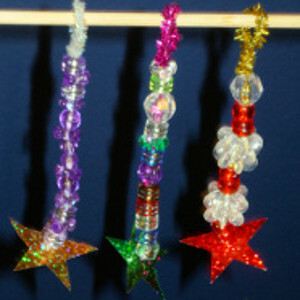 Easy Icicle Ornaments for Kids (pg. 5): The possibilities are endless with a tub of colorful beads and your child's imagination. Check out this kids Christmas craft full of shimmer and shine. Tiered Christmas Tree Ornament (pg. 11): If you have leftover scraps of paper, this is the ornament for your kids to make. Your children will love creating miniature paper trees to hang on your big evergreen. Mini-Stocking Ornaments (pg. 14): Christmas stockings aren't just for decorating your fireplace. You can also make these adorable little red Santa boots to adorn your Christmas tree as well. One of the many Christmas traditions that people hold dear is sending Christmas cards. Everyone loves to make them, and everyone loves to receive them. In your adult years, it's an opportunity to catch people up on how your family's year went and to send your best holiday wishes. In your childhood years, it's a great way to generate excitement for the days (or months) leading up to Christmas. Even more fun (if everyone is going to be honest) is the traditional Christmas gift exchange. Whether your family opens presents on Christmas Eve or waits until Christmas morning, everyone loves the gift-giving and gift-getting experience. While kids' financial sources are a bit limited, they're imagination and creativity are boundless. Give your kids the opportunity to experience the rewarding moment of someone appreciating their gifts by showing them how to craft. By making cards and gifts on their own, kids can learn about the spirit of giving while having a ton of fun. This section is filled from beginning to end with Christmas crafts your kids will love to make and give out to their friends and loved ones. They'll love letting their creative juices flow while they complete these projects. But even more, they'll love knowing that they made someone feel cared for and appreciated. Decoupage Frame (pg. 16): Quickly and easily spread the joy of Christmas throughout a loved one's home with this easy kids Christmas craft. Your kids will have a great time decorating a picture frame with festive wrapping paper to give to grandma and grandpa. 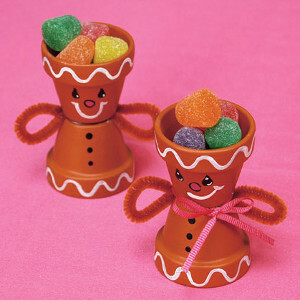 Gingerbread Candy Cups (pg. 19): Nothing beats a craft involving candy. Easy Christmas crafts for kids like these gingerbread cups are the perfect way to make someone feel holly jolly. This craft is perfect to give to a friend, an aunt or uncle, or a teacher. Gumdrop Card Holders (pg. 21): This great craft takes table setting to a whole new level. Help your kids make a set of these little card holders to give to a family member as a low-budget gift. Make your entire home feel like Christmas by decking the halls the crafty way. These easy-to-make decorations are all budget-friendly and a blast to produce. Your kids will love making memories while they're making Christmas decorations. From stockings to elves to wreaths and more, poke around to see what this section has in store. You'll love what you and your kids can make together to get your home ready for the holiday. As with ornaments, Christmas decorations can become an unnecessary expense in the grand scheme of the holiday. When you're already pouring money into buying the best Christmas gifts you can for your loved ones and also preparing a festive Christmas dinner, you might not want to go all out on the decorations too. Fortunately, you don't have to hit up the store to get your home Christmas-ready. Your kids have your crafty spirit, so show them how to put it toward making Christmas decorations to fill your entire house. Check out this section to find numerous ideas for decorating your home. You'll love what your kids can create, and your kids will love seeing their handiwork displayed for all to enjoy. Sparkle Name Stockings (pg. 26): Use iron-on designs and paint to decorate plain Christmas stockings this holiday season. Be creative and add a bit of sparkle to your Christmas decorations with this easy stocking craft. 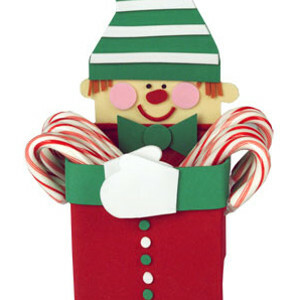 Elf Candy Cane Holder (pg. 31): Candy canes are a staple of the Christmas season, so you might as well craft a place to put them. This kids Christmas craft is the perfect way to keep your kids creative and busy while making something festive and functional. A Pair of Pinecone Place Settings (pg. 35): Show your kids how to make a centerpiece you can use year after year after year. These adorable felt pinecones are perfect for Christmas, and you can also use them for Thanksgiving too. The materials for this craft are very inexpensive, so it's the perfect way to decorate on a budget. As you'll find in this free eBook, Christmas crafts take any number of festive forms. Christmas is a holly and jolly time to celebrate with yoru family, so don't let all your holiday needs bog you down. Your family can get ready for Christmas with ease by making any of these kid-friendly Christmas craft projects. Five weekly emails with free crafting patterns, tips, collection pages, videos and more plus a weekly wrap-up. Make this the best Christmas you've ever had with these awesome Christmas crafts for kids. From homemade Christmas cards to DIY ornaments, the projects in Santa's Guide to Easy Christmas Crafts for Kids are great for crafters of all ages and expertise. Download your free copy of Santa's Guide to Easy Christmas Crafts for Kids today!